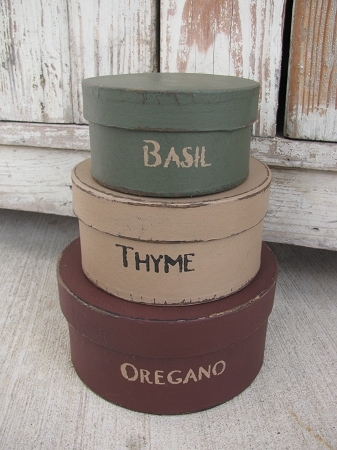 Small Set 6", 5", 4"
Primitive Country Kitchen Herb Round Stacking Boxes Set of 3. 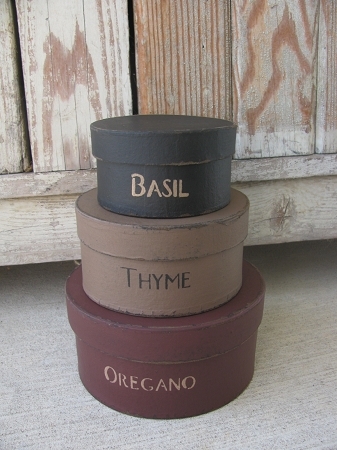 This is a great smaller set of stacking boxes for your kitchen decor. 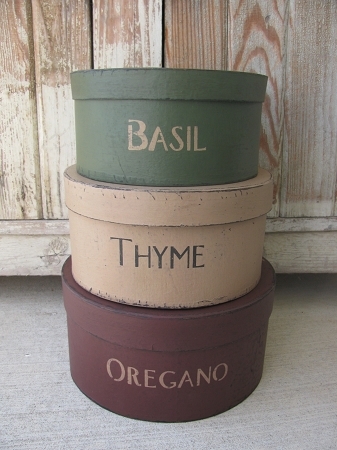 Labeled with Herbs, Oregano, and Thyme. Colors of the boxes are khaki tan, burgundy and Garden Shed. NEW- A few other color options have been added and are available. Bottom box color is listed first and goes up from there. Size stacked is 8" tall x 6" diameter bottom box. Round shape. Hand painted, designed by Heidi.